As CSN finished up midterms and students from UNLV wrapped up spring break, CARP Las Vegas held their final two day Divine Principle retreat of the semester. Students took time out of their busy lives to rejuvenate their spirits and get back on their feet to finish the semester strong. In attendance were five guests (two new, three returning), ten community members, and eleven CARP members - a total of 26 people. Out of the 26, three participants drove a total of 18 hours from Oregon to attend the workshop. Misato Koiso (left) and Ilya Hack (right) welcome the participants to the workshop. The following day started with a quick energizer to wake up the participants. They started with a guided meditation through an app called Headspace. 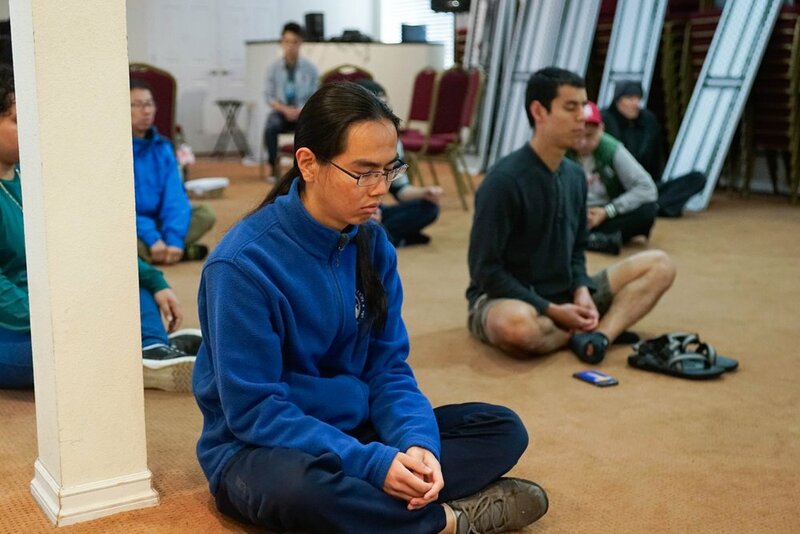 The meditation was carried out to allow the participants to be present in their mind so they can be present in their life. Afterwards, they took time to reflect on three points in their life - gratitude, challenges, and hopes moving forward. With their hearts filled with peace and their stomachs filled with a great breakfast, the participants were ready to receive the Divine Principle lectures.